Muto is the archenemy of a *specific* version of Superman. We thus strongly suggest that you first read our Superman of 2465 character profile for context. Base Of Operations: Universal mobile. Height: 4’2” Weight: 90 lbs. A superior intellect and willpower. He can also somehow create a “mental force field”. That renders him immune to all disease. His weaknesses are his relative physical frailty and his great arrogance and overconfidence. He will regularly spend Hero Points to act faster than Superman and rapidly encase him in sea water. 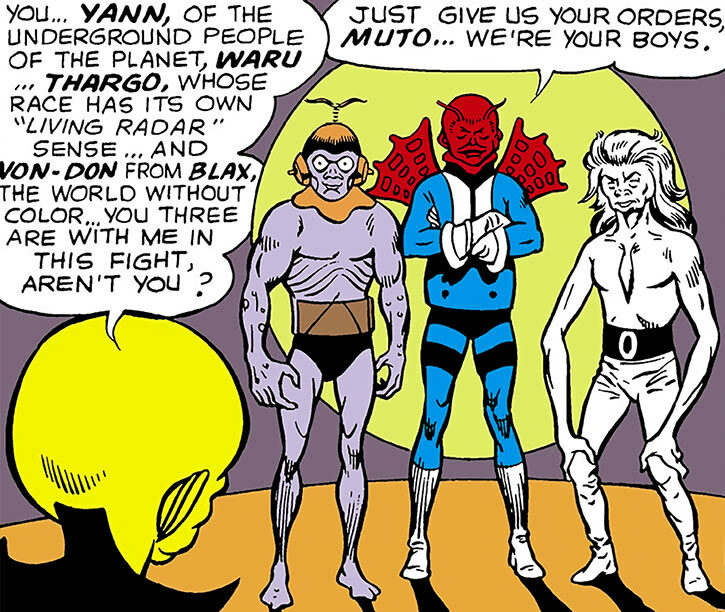 Muto is the archenemy of Superman of 2465. 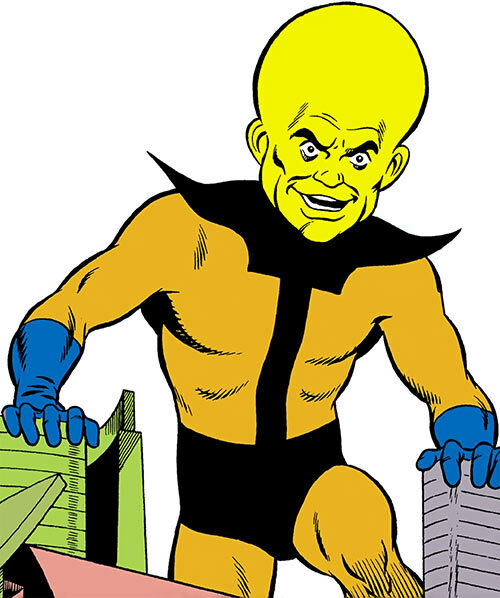 Although told briefly in the first books, his origin was later expanded upon in the reimagining issue. When Superman’s father, the previous Superman, had destroyed a meteoroid headed for the Earth, the event opened a space singularity. A survey ship with a couple and their kid was sucked into it. That landed them in an alternate dimension , which was only populated by robots. The robots experimented on the kid. They altered his genes and turned him into a mutate genius with telekinetic powers and other robotic traits. When the boy returned to his home dimension as Muto – the Monarch of Menace – he could only see humans as servants and thus proceeded to take over the world. While Muto’s history is carefully recorded during the years 2465-2467 a few earlier details are also known. Muto managed to rob a Neptunian treasure-bank, which boosted him into infamy (Superman v1 #181). In 2465 Muto tried to defeat Superman with Kryptonite towards which he was immune and so that failed. In 2466 Superman again faced Muto with the villain’s three alien lieutenants Yann, Thargo and Von-Don in sector Z-44. Maybe that’s sector 44 as per the Green Lantern mythos? This sector housed Weapon’s World, a world to which all the weapons of the universe were banished when the Planetary Federation outlawed war. Checking up on this most dangerous of places Superman soon found out that Muto and gang were already there! After a skirmish Muto got away and was traced to another planet. There he used his formidable powers to create a flood that threatened to destroy some children, which were secretly android decoys. Getting hit by the flood Superman was left paralyzed and depowered under water (Action Comics #338). Superman, however, managed to use his now limited heat vision to reprogram the android children. These carried him out of the water, upon which all his powers returned. He curiously left the children androids on a world whose human population had all died out in a plague. Therefore, it was now populated only by androids. Looking for clues he was suddenly contacted by all the telepathic citizens of Earth’s Atlantis city. These informed the Man of Steel that Muto was back on Earth. Superman found Muto’s ship at the bottom of a sea. Being unable to enter the ocean, he tried to use a colossal grappling hook to lift it up. But Superman was attacked by a gigantic waterspout of Muto’s making. However, Superman came prepared this time. He was wearing a flying-jet that automatically started as water hit it, allowing him his escape. He received help from the Atlanteans in fishing up the ship from the sea bottom. From inside the ship he captured one of Muto’s lieutenants. Having no further clues on Muto or how to defeat him Superman checked through some micro-reel files to find out Muto’s weakness. Such a weak point had been previously implied in the villain’s gloating. Just as he figured it out, Muto addressed Metropolis through the Ultra-News. Facing Muto in the skies over Metropolis he was encased in sea water by Muto’s transmutative powers. As a consequence he fell, powerless, towards the ground. Meanwhile, Muto opened fire against the city. Just as Superman could recover through the use of his flight belt, Muto got away while all the citizens started to grow into giants! Quick to recover, Superman picked up an old defense against the growth ray. 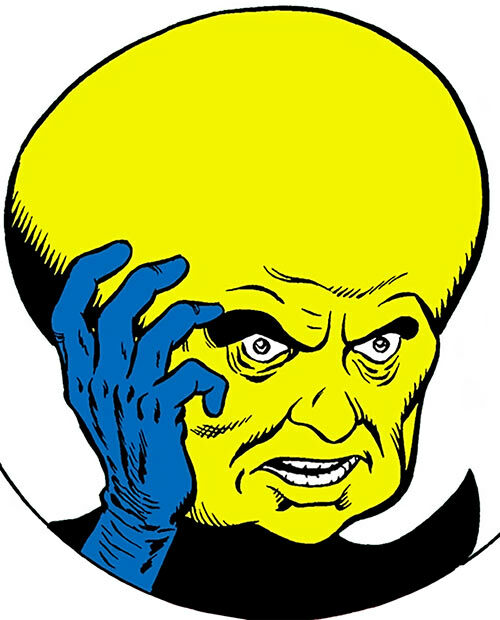 It was a shrinking ray (Brainiac’s shrinking ray?) which had been used in wartimes from the so-called Museum World. And so the Man of Steel handily saved the city and the citizens. Soon tracking down the villains again they attacked him with helium bombs, the most powerful weapons in the universe. As Superman was unaffected by the explosions, Muto opted to throw a water bomb at him in the end. But the now powerless Superman was again saved by his flight belt. Soon he destroyed Muto’s flying ship while Muto was again making his escape. Still tracking Muto he found that the villain was now under the ice of the Antarctic. Refusing to walk into a lethal trap of everlasting water Superman quickly built a giant lightning rod and drew some storm clouds close to it using his super breath. As planned the lightning soon struck Muto. 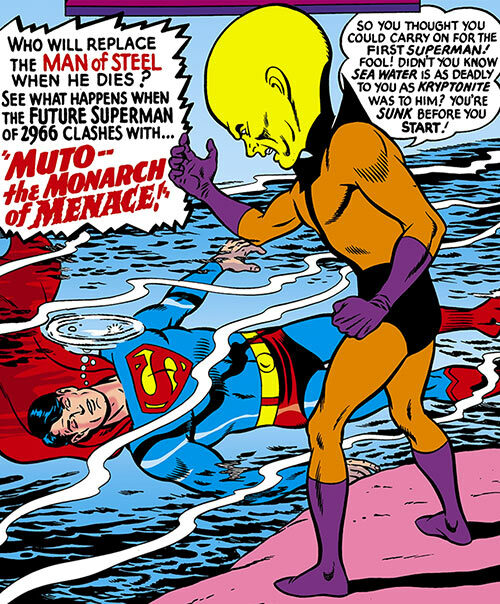 Due to his natural link with his birth dimension, the Monarch of Menace was immediately banished there, likely for a very long time (Action Comics #339). But that never stops him permanently as he later, in 2467, resurfaced along the Joker to again fight Superman and his ally the Batman. He has not been seen since this last defeat (World’s Finest #166). Muto is a diminutive mutant with an enlarged head (shaped like a pear upside down) and yellow skin. His body language is alien, his visage ghastly and his demeanor threatening. Muto is a twisted, evil genius, almost like a naughty child. He desires power, attention and revenge. The power to control anyone and everything. The attention that his greatness deserves. 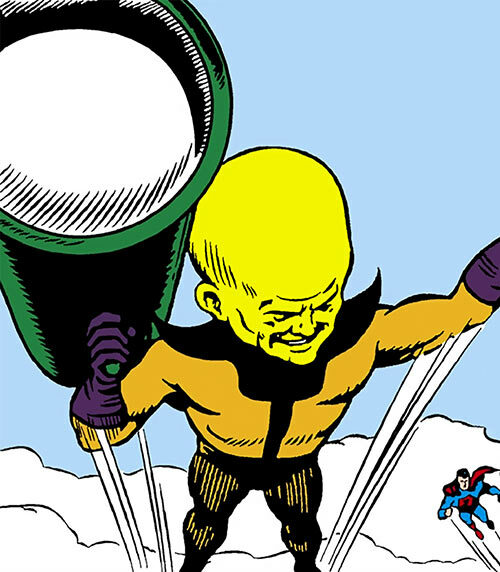 And the revenge against the whole Superman line for having made him into a super-brained freak. He has superior confidence in his abilities and powers but still always has an escape plan ready. 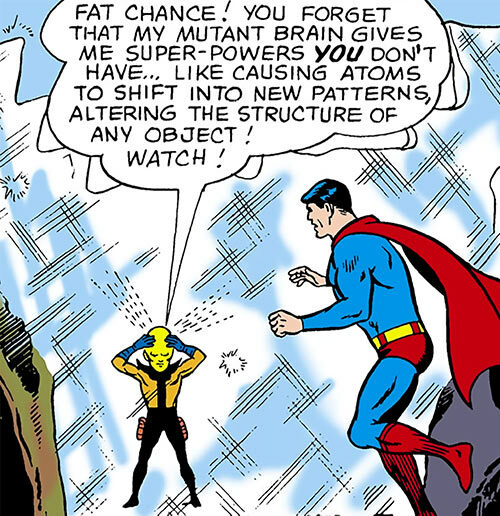 While saving the knowledge of Superman’s vulnerability for later encounters, once he started to employ it against Superman he consistently and constantly did so. His headquarters was placed at the bottom of a sea and Superman would always be immersed in sea water when the encountered each other. While a genius he seems a bit slow on learning from his past mistakes. He regularly employs various alien criminals as henchmen, pilots, etc.. He also will team up with other super-powered criminals for the common goal of mayhem, power and chaos. He will make his appearance a great threat, taunt and media spectacle whenever he chooses to make his new, great master plan a reality. This usually includes luring his foes to him and his death traps. He greatly enjoys toying with his enemies and to draw out the drama for as long as possible before his inevitable victory which, against Superman, instead has turned into several defeats. In fact, he would probably win if he just dispatched his enemies at once without playing or unnecessary delays, but that’s not in his nature. Shrinking is Always On (-1) and Already Calculated into his Stats. All Powers except Shrinking are derived from Telekinesis (-1). Area Knowledge (The Planetary Federation), Genius. Strange Appearance, MIA (Bringing vengeance towards the Superman dynasty), Misc. (body mass is 1 AP), Misc. Any Lightning-based attack of at least 08 APs will automatically transport him unharmed to his home dimension if striking him; he has no easy escape from there and has to tax his superior mind for a long time before devising an escape plan back to the Earth dimension. Jet Pack [BODY 02, Flight 08, Notes: His jet pack seems to have near unlimited use and power: futuristic jet packs may be nuclear-powered and will therefore likely not run out of power during the entire course of several adventures. Or, if powered by liquid fuel, Muto could naturally create further fuel as needed given his transmutative powers, which is also true with the nuclear-powered scenario. In any case the device will have R#0]. Muto may be given the Oblivious Drawback to keep him from learning and remembering vital information if the GM wishes to highlight his apparent inability to learn from his mistakes. But this may instead be a common tactic to lure his enemies into a sense of false security. Muto, being a genius of alien caliber, very likely also has additional Skills (such as Thief) available as well as possibly further Powers (such as Force Field) and Connections. This should be considered by the GM wanting to make him into an even more formidable threat. His overconfidence and arrogance can be simulated by giving him the Overconfident Drawback. 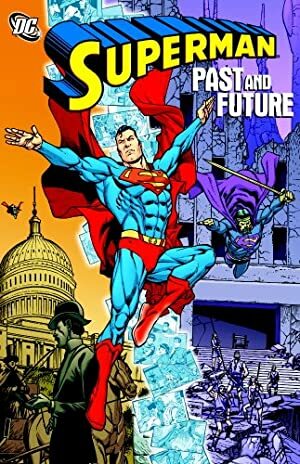 Source of Character: Superman v1 #181 (1965) (reprinted in Superman v1 #244) and Action Comics #338, #339 (1968) plus World’s Finest #166, stories by Edmond Hamilton. Writeup completed on the 28th of February, 2014.